Full documentation for the Publisher can be found here! This is the Admin Guide for Shotgun Integrations. This is the User Guide for Shotgun Integrations. If you have access to the Shotgun Pipeline Toolkit, you also have access to the source code for all apps, engines and frameworks in Github where we store and manage them. Feel free to evolve these items; use them as a base for further independent development, make changes (and submit pull requests back to us!) or simply tinker with them to see how they have been built and how the toolkit works. You can access this code repository at https://github.com/shotgunsoftware/tk-multi-publish2. You need Shotgun Pipeline Toolkit Core API version v0.18.153 or higher to use this. Description: If true (default), clicking the Publish button will execute the validation logic before publishing. If false, validation will be skipped. If false, and no validation has been manually triggered, a popup, confirmation dialog will be displayed before proceeding with the publish logic. NOTE: This is an advanced option. Setting this to 'false' will most likely break the shipped toolkit integrations which assume validation is always run before publishing. Description: List of publish plugins. Description: A hook that defines logic to be executed after each phase of publish execution including validation, publish, and finalization. 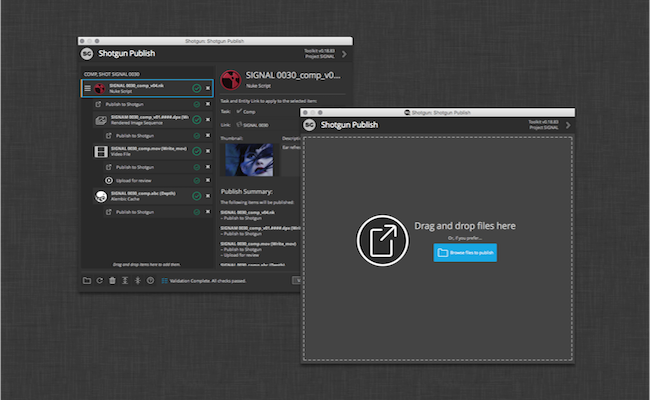 This allows for very specific curation and customization of the publish tree during a publish session. Serializing the publish tree to disk after validation, for example is possible via this hook. Description: This hook contains methods that are used during publishing to infer information from file paths. This includes version and frame number identification, publish display name, image sequence paths, etc. Description: The url to open when the 'help' button is clicked in the publisher. The url should typically lead to a page that outlines the studio's publishing workflow. If no url is provided, the help button will not be displayed. Description: Shorter version of display_name setting, used as button name. Description: Logic for extracting items from the scene and from dropped files. Description: If true (default, normal operation), the user can interact with the main dialog to drop files or folders. The user can also use the browse buttons to select files or folders. When false, the feature basically disable the user ability to add anything to the project. Improved the description in the documentation for the get_ui_settings method, to hopefully make the method's purpose clearer. There is no change in app behaviour with this release. Minor styling change for a button to fix an issue in Houdini 17. Houdini's native stylesheet causes QToolButtons to be given a specific size that is too small in most situations. This change to the publish app sets a minimum size for an affected button so that it maintains a usable width in Houdini 17. Very minor documentation typo correction. No functional changes to the app. The only fix is for a typo in the documentation for the base publish plugin. Fixes a serialization bug with templates and introduces the publish_user property on items. The new publisher_user property on publish items can be used to override the user resolution logic from sgtk.util.register_publish. One use for this would be on a render farm to register a publish with the user who submitted the job and not the script user running the job. You can read more about this new property here. Publisher log messages in the UI are now colorized. Thanks to jhultgre for your contribution. Introduces the standalone publish API. The standalone publish API allows you to do the same operations in a script that you can do with the Toolkit application. As such, you can entirely automate the publish process without any user interaction or use it on a render farm in order to automate the publication of rendered jobs. To learn more about the api, you can visit this page. Fixes an intermittent garbage collection issue. Updated to use context selection widget from tk-framework-qtwidgets. Version uploads will now use the full filename as the version name. Prior to this, the version number was stripped. base publish plugin now allows work & publish templates to be defined in item properties. will handle copy from work to publish location at publish time. Checks for failed or zero-size thumbnails. This keeps us from plowing ahead and asking the SG API to upload a non existent or zero-size jpg file, which would cause it to fail ungracefully. Instead, we log the result and continue on without a thumbnail if a problem occurs and one can't be properly written to disk. Addresses a bug that was causing unnecessary queries to populate related tasks when selecting an item on the left.